"In the future, the technology that controls the weather, controls the world." 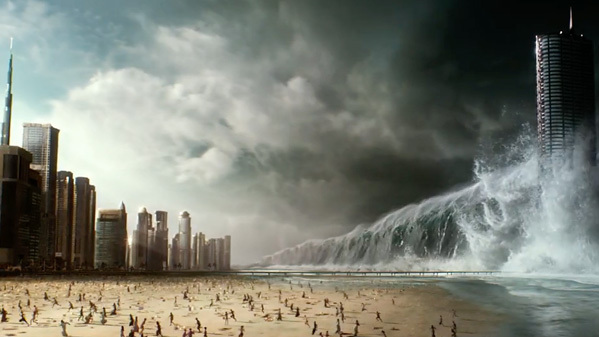 Warner Bros has debuted the first official teaser trailer for the disaster movie titled Geostorm, which follows in the footsteps of movies like 2012 and The Day After Tomorrow by presenting a scenario where the entire world is being destroyed by a massive destabilization of our climate. Gerard Butler stars as the hero who has to save the day entire world by going into space to try and fix the problem. The full cast includes Jim Sturgess, Abbie Cornish, Alexandra Maria Lara, Daniel Wu, with Oscar nominees Ed Harris and Andy Garcia. Thankfully this first teaser trailer doesn't hold back on shots of the destruction, but as always, I'm hoping there's an interesting story to follow here or this is going to be forgotten. The weather control concept seems so cheesy. After an unprecedented series of natural disasters threatened the planet, the world came together to create an intricate network of satellites to control the global climate and keep everyone safe. But now, something has gone wrong—the system built to protect the Earth is attacking it, and it’s a race against the clock to uncover the real threat before a worldwide geostorm wipes out everything…and everyone along with it. Geostorm is both written and directed by Dean Devlin, a veteran producer and writer making his feature directorial debut with this movie, after directing a few episodes of "Leverage" and "The Librarians" previously. The screenplay is co-written by Dean Devlin and Paul Guyot. Warner Bros will release Devlin's Geostorm in theaters everywhere starting on October 20th, 2017 later this fall. Interested in seeing this?